More than 2,300 people have been killed from ice buildup on aircraft, problems on runways, faulty aircraft maintenance and repairs and overtired pilots, despite dozens of NTSB recommendations to address those problems. Every year, planes crash in accidents that could have been avoided. Ice can build up on the wings of a plane like it did in 1997 when a plane trying to land at the Detroit airport lost speed and plummeted to the ground, killing all 29 on board. Sometimes the hazard is on the runway, as when a 2006 Comair flight made a wrong turn onto a short runway in Lexington, Ky. The plane couldn’t get airborne and crashed, killing 49. The problem might be a poor repair job. That was the case in 2005 when the right wing fell off of a Chalk’s Ocean Airways flight just after takeoff from Miami. Two crew members and all 18 passengers died. And then there are the times when a pilot is just too exhausted to fly and does so anyway. That is what investigators believe happened in 2004 when a Corporate Airlines plane crashed short of the runway in Kirksville, Mo. The two pilots had been working for nearly 15 hours and were on their sixth flight of the day. The Federal Aviation Administration lists pilot error as the leading cause of plane accidents, but pilot error is almost always part of a chain of events that starts with something like an iced-up wing, a piece of equipment that fails or a close encounter on a runway. An analysis of accident data by the News21 reporting project and the Center for Public Integrity shows that the major causes of air accidents include ice buildup on aircraft, problems on runways, faulty aircraft maintenance and repairs and overtired pilots. For four decades, the nation’s transportation safety board has urged the FAA to take steps to reduce the likelihood of these kinds of accidents. The National Transportation Safety Board has issued more than 520 recommendations related to icing, runways, repairs and fatigue. 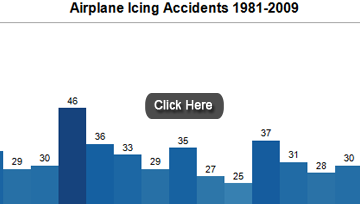 •	More than 710 people have died in crashes in which ice has built up on the wings of aircraft since 1981, when the NTSB first recommended ways to solve in-flight icing problems. 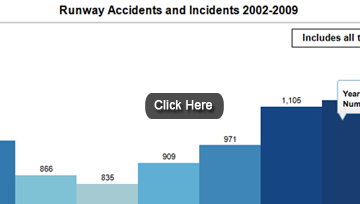 •	Runway collisions have killed at least 112 people since 1990. There have been at least 79 collisions and 342 near-collisions on the nation’s runways and thousands more violations of runway safety over the past 20 years. 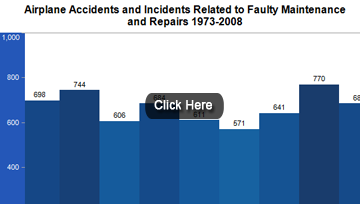 •	At least 160 accidents on passenger planes resulted at least in part from poor maintenance or repairs. 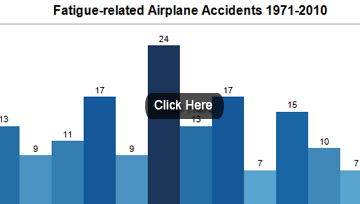 These accidents have killed 756 and injured 805 people since 1973, when the FAA started keeping records. •	More than 745 people have died while in the hands of tired pilots in at least 342 accidents since 1971, around the time the NTSB first named fatigue as a major issue and suggested solutions. Planes are still a comparatively safe way for Americans to travel. People are about six times more likely to die in car crashes than plane crashes, according to Bureau of Transportation Statistics data from 2004-2008. However, there’s little doubt that air travel would be safer if the airline industry and the FAA – the federal agency charged with making sure that air flight is safe for Americans – would comply with safety recommendations. Recommendations languish for many reasons: The process of changing rules is long and complex; industries resist expensive fixes; unions fight changes in work requirements; and sometimes years of research and product development are needed. But many believe that the biggest cause of delay lies with the FAA itself. An examination of hundreds of letters between the NTSB and the FAA reveals a pattern of resistance dating back decades. Tricia Coffman still breaks down in tears when she remembers the phone call telling her that her husband died in a plane crash in Pueblo, Colo., along with seven others in 2005.